Xobni: the killer Outlook addin you can't live without! Microsoft Outlook 2007 offers a unique feature that allows you to type out text to tell Outlook which day you would like for an appointment, instead of selecting a numbered date. In addition to creating signatures, you can also create vCards (or electronic business cards) to attach to these emails. 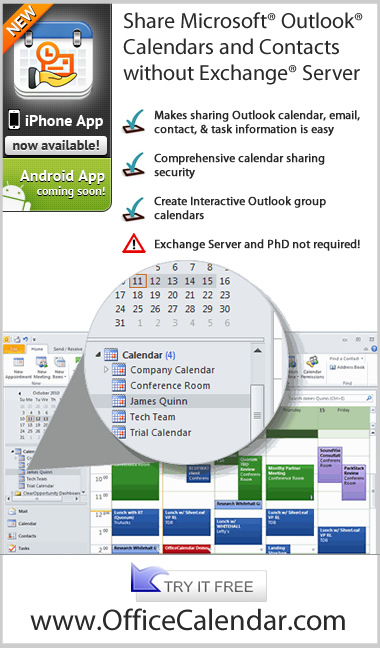 Lookout Software LLC., has just released 3StepShare, a new and easy-to-use alternative to Microsoft Exchange Server that allows colleagues to share their Outlook calendar, contact, email and task folders.